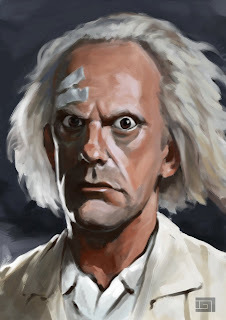 Black Coffee and Green Tea: Happy Birthday, Christopher Lloyd! Happy 72nd birthday to the greatest Doc Brown of all time! Thank you, Mr. Lloyd, for unintentionally becoming such a huge part of my life. That man looks GREAT for his age. And, if you haven't pre-ordered the Blu-ray Back to the Future: 25th Anniversary Trilogy Box Set (with a digital copy for Pete's sake! ), what are you waiting for?? Do it now!